Whatever do you suppose I'll be doing next?? Kathy (also known as Shawkl) posted a link on her blog to THE most stupendous goldwork embroidery and I was totally blown away by the talent this man has. Go HERE to see and be sure to scroll down so you can see the scope of his work. Amazing! Has more sites for you????? Why, this little owl does! First, SharonB of Pintangle (who is one of the most generous stitching souls on this planet) has announced her new *free* stitching/teaching project for 2013 HERE. It will be a different twist on her very popular TAST (Take A Stitch Tuesdays) series. Have a look and read all about it! I can guarantee you will learn a lot about stitching from Sharon. Next, I've sent you to see the incredible work that Evy does before, but you just HAVE to go and see this! To say that I have the covet-itis is a huge understatement. Go HERE! Be sure to scroll down to see all the juicy details. 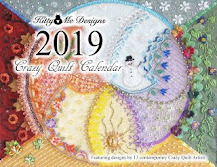 Lastly (but certainly not 'leastly') - Shawkl has just announced her new crazy quilting calendar for 2013 is available on Magcloud. I just ordered mine and can't wait for it to arrive. 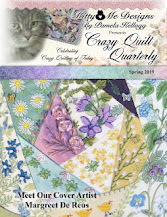 She has included patterns and lots of eye candy! Go HERE for the details. Oh, and why the wee owl? at the CQTeers meeting yesterday!